One of the many things New Yorkers are blessed with is being resident to the most exciting and entertaining city in the U.S., yet having relatively quick, easy access to a completely different environment as needed. One minute you can be in the middle of the vibrancy and chaos of Time Square or Grand Central Station; the captivation and beauty of various art exhibits at venues such as the Met, Guggenheim or Chelsea Galleries, and then the next be surrounded by the quiet, grandeur and awesomeness of the Catskill Mountains or the expanse and wonder of the Atlantic and its many beaches of Long Island. Of course, the afore mentioned descriptions of NYC locales are laced with flattering adjectives. Albeit true, some of that vibrancy and excitement can go hand in hand with much stress and frustration. As much we may love it, even feed on it, sometimes you want and need a break from it if you live in it 24-7. And if you’re a frequent visitor, you need to experience the other sides of NY. Think of it as likened to a simple syrup recipe of two parts to one. If you go Upstate, which is where my weekend getaways usually take me, just driving along the truck-less, bus-less and traffic-less Taconic Parkway can be therapeutic. It’s literally just a matter of minutes before your setting is transformed and you’re getting glimpses of greenery and hills that soon give way to mountain ranges. When you get far enough along, you are ensured the towns along the way will be towns and not suburbia. Some are sad and uneventful giving the impression of having seen better, more prosperous days. But most are quaint, charming and welcomingly slow. When most people from New York City head Upstate they usually only make it as far as Dutchess or Ulster counties, covering territory such as Woodstock, Cold Springs, Red Hook and the DIA museum in Beacon and the Storm King outdoor sculpture installation in Mountainville. As interesting and impressive as these destinations are (especially DIA and Storm King, but that’s for another article), they fall short of what lies not too much further ahead. Columbia County, NY and the Berkshires, MA. From Upper Manhattan you can hit Columbia County in exactly 1:15- 1:30. One of the first towns you would hit, and a personal favorite, is Hudson. The center of Hudson is Warren Street, which not too long ago was nothing much to speak of- neglected storefronts and dilapidated or debunked restaurants- but now that’s all changed. Warren Street, covering about a 10-block stretch, epitomizes small town charm with big city artist influences. A few years ago numerous NYC residents and/or business owners decided to forego the escalating rents of Manhattan (commercial and residential no doubt) for more reasonable rates. The results are an impressive collection of upscale antique shops, art galleries and eateries. Despite the short pleasant drive getting to Hudson, Michael and me are always ready for lunch. In our defense, we usually sacrificed breakfast to pack and pick up the rental car and are purposely “saving our appetite” for the treat that lies before us. But before we “officially” lunch, we partake in healthy snacking at a local farm stand just 2 miles shy of the town’s center. We cannot resist the opportunity to get a few fresh picked fruits or veggies, without having to take two subway transfers to the Union Square Green Market. The Market is great, but this is us going to the source instead of the source coming to us. We’re talking corn so fresh and flavorful Michael chomps down right then and there- no boiling or grilling (as if we grill in New York) necessary. If it’s fall, we can actually pick our own apples, with two huge bagfuls for a whopping $8! But I digress. 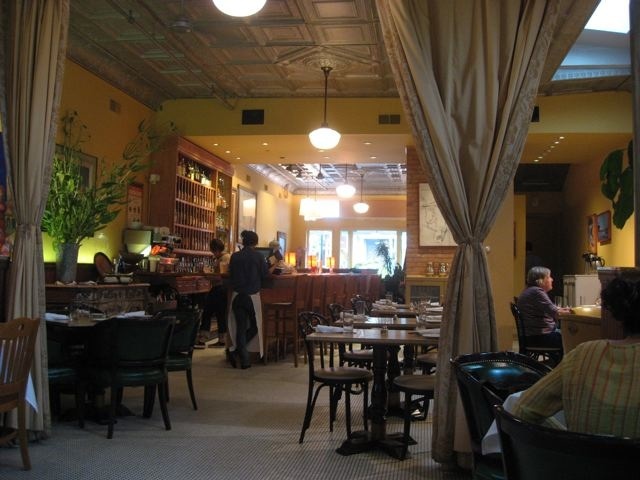 Entering Hudson we make a straight shot for Le Gamin, an authentic, casual French café originally limited to the East Village and Brooklyn locations but now also a favorite on Warren. Although Le Gamin is a mix of regulars and city visitors, the genuine casualness and friendliness of the owners and staff make everyone feel like a local and no one is rushed out in an effort to “turn tables.” This makes for the best first stop (along with the produce stand) in our trip. Now the city stress is successfully starting it’s inevitable and welcome decline with that initial sip of coffee, kicking back in the booth and plotting out the day. Next it’s important to exercise after a good meal so a stroll along Warren is imperative, going in and out various shops, including two fantastic bookstores (Hudson City Books, Spotty Dog Books and Ale), art galleries and an impressive wine shop (Hudson Wine Merchant). We’re not in NYC any more so a car is necessary and a nice change to explore neighboring towns (Philmont, Chatham) and beautiful country roads (71, ). Before wrapping up the day, we continue our de-stressing with a very professional, relaxing massage at Bohdi Spa also on Warren Street and across from one of our favorite restaurants. Swoon is an appropriate name cause swoon we did upon our first visit- a NYC foodie’s delight in the heart of the Catskills. The entrance to the restaurant engulfs you lovely flowers and herbs as if inviting you to nature’s delights. And so it is. The Swoon philosophy is based on serving seasonal and local, and being Upstate, local means they just got a delivery from a farmer a couple hours ago. For a weekend getaway time is of the essence, so how we end the day is just as important as how we begin. For us in Hudson that means one of the most beautiful and best B&Bs in the area- Mount Merino Manor. Under the design and ownership of Rita and Patrick Birmingham, this newly renovated mansion offers seven luxurious guest rooms and suites (individually designed and decorated) sitting on a lush hilltop surrounded by 100 acres of woodlands, with views of the Hudson River and Catskill Mountains, along with easy access to hiking trails in Olana State Historic Site. Additionally, no matter who’s cooking breakfast when you’re there, Rita or Patrick, it will not be the bland B&B breakfast-as-usual. Their meal will appease and thrill any New York foodie. Of course this is a getaway for residents and maybe a side trip for visitors, so there’s no need to feel you have to pack your time with endless activities. Take advantage of being in a lower gear. Benches abound throughout Upstate towns and parks. Do something or do nothing, but do avail yourself to what lies just North of that great city that never sleeps.